This Starbucks Coffee Gift Basket is always a big hit! A great combination, Starbucks Coffee is paired with Brown & Haley’s Almond Roca, Chocolate Almond Gourmet Popcorn, Seattle Chocolate San Juan Sea Salt Truffle Bar, Chukar Chocolate Vanilla Almonds and a Chocolate Dipped Chocolate Chunk Gourmet Cookie. 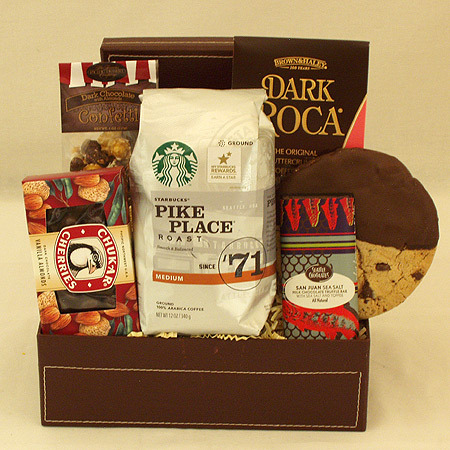 A great Seattle Gift Basket of Chocolates and Coffee for any coffee lover!